GOLD RIVER, Calif. -- Tennis fans thought they had seen everything when John Isner defeated Nicolas Mahut 70-68 in the fifth set in the first round at Wimbledon three years ago. Sunday's second-round qualifying match between sixth-seeded Jessica Lawrence and wild card Yasmin Schnack in the $50,000 FSP Gold River Women's Challenger began with 18 consecutive service breaks and featured 25 total. The players held serve only seven times in the match, won by Lawrence 6-7 (7), 7-5, 6-2 at the Gold River Racquet Club in the Sacramento area. The USTA Pro Circuit record book does not include service breaks, but the tournament supervisor, Billie Lipp of the USTA, said she couldn't recall so many in a row or total. She has held her position for 24 years. Lawrence, a 19-year-old professional from Lake Worth, Fla., converted 77.5 percent of her first serves and double-faulted three times. Schnack, a 25-year-old former pro from Sacramento, put in only 42.9 percent of her first serves and committed six double-faults. "I feel like I have a good serve, but today my serve was not on," said the 5-foot-10 (1.77-meter) Schnack, who won the doubles title in last year's inaugural Gold River Challenger with Asia Muhammad before retiring in November. "I wasn't serving well, and her serve is not a strength. She has kind of a weak second serve, and her first serve doesn't do any damage, so I felt I could really control and dictate off the returns. "She was doing the same on my serves. I wasn't getting a high percentage of first serves in, and my second serves were too weak, so it just led to break after break after break." The match began at 10:10 a.m. and ended 2 hours, 48 minutes later, including a 10-minute break after the second set because of extreme heat. The temperature peaked at 105 degrees Fahrenheit (40.6 Celsius) at 3:25 p.m., and Monday's predicted high is 110 (43.3). Schnack served for the match at 5-4 in the second set but -- surprise! -- was broken. She lost the last three games of the set and the first five games of the second set as she wilted in the heat. Until an easy victory Saturday, the former UCLA All-American hadn't played singles since early November. "She played really well. She was solid and didn't make many unforced errors. I had to go out there and win it. I tried, but it didn't go my way today." The heat didn't seem to bother Lawrence. After actually holding serve for 3-0 in the third set, she jogged to her chair. "I train a lot of hours, and I think that really helped me," said the 5-foot-4 (1.63-meter), 125-pound (56.7-kilogram) Lawrence, who wore baggy capri pants in the match. "I felt fresh. I was ready to go and play another few sets," she added with a laugh. Lawrence will face Elizabeth Profit, 16, of Bellflower in the Los Angeles area on Monday for a berth in the main draw. Profit, who has Type 1 diabetes, plays with an insulin pump attached to the waistband of her tennis skirt. She upset third-seeded Jacqueline Cako, who finished an All-America career at Arizona State in May, 6-4, 6-4. Cako, the Pac-12 Senior Scholar Athlete of the Year, graduated in three years with a degree in biological sciences and a 3.68 grade-point average. She plans to attend medical school after playing professionally. Alisa Kleybanova, who reached No. 20 in the world in 2011, continued her comeback from Hodgkin's lymphoma with a 6-2, 6-2 victory over Malika Rose, an All-Big 12 Conference selection as a senior at Oklahoma State this past season. Kleybanova will play top-seeded Julia Boserup of Newport Beach in Southern California. Boserup, playing her first tournament since early November after recovering from a bulging disc in her back, defeated Csilla Borsanyi of Hungary 6-2, 6-3. At Gold River Racquet Club in Gold River, Calif.
Julia Boserup (1), United States, def. Csilla Borsanyi, Hungary, 6-2, 6-3. Robin Anderson, United States, def. Keri Wong, United States, 6-1, 7-5. Anne-Liz Jeukeng (7), United States, def. Parris Todd, United States, 6-1, 6-3. Alisa Kleybanova, Russia, def. Malika Rose, United States, 6-2, 6-2. Elizabeth Profit, United States, def. Jacqueline Cako (3), United States, 6-4, 6-4. Mary Weatherholt, United States, def. Dianne Hollands, New Zealand, 7-5, 6-2. Nicole Robinson (8), United States, def. Daria Kulbikova, Russia, 6-2, 6-4. Julia Boserup (1) vs. Alisa Kleybanova (final round of qualifying). Emily Webley-Smith vs. Madison Brengel (5). Victoria Duval (8) vs. Mayo Hibi. Elizabeth Profit vs. Jessica Lawrence (6) (final round of qualifying). Sanaz Marand vs. Ashley Weinhold. Julie Coin and Keri Wong (3) vs. Robin Anderson and Lauren Embree. Robin Anderson vs. Anne Liz Jeukeng (7) (final round of qualifying). Ivana Lisjak vs. Natalie Pluskota. Mary Weatherholt vs. Nicole Robinson (8) (final round of qualifying). Allie Kick vs. Brianna Morgan. Macall Harkins and Zoe Scandalis vs. Dianne Hollands and Kady Pooler. GOLD RIVER, Calif. -- Alisa Kleybanova passed another test Saturday in her comeback from cancer. Namely heat. A lot of it. Kleybanova, a hard-hitting Russian formerly ranked among the world's top 20, defeated fifth-seeded Diana Ospina, a 33-year-old American, 6-3, 6-2 in the first round of qualifying for the $50,000 FSP Gold River Women's Challenger at the Gold River Racquet Club in the Sacramento area. The match started at 11:42 a.m. on a day when the temperature reached 107 degrees Fahrenheit (41.7 Celsius). Highs are scheduled to remain at least 102 (38.9) through Thursday, peaking at an unheard-of 111 (43.9) on Tuesday, before dropping into the mid-90s (about 35.0) Friday and Saturday. Mercifully, night matches are scheduled for Tuesday through Saturday's final. "It takes a little bit to get used to it," the 23-year-old Kleybanova, 5-foot-11 (1.81 meters) and 159 pounds (72 kilograms), said of the heat. "Especially when you play longer points, it's tough. I felt pretty good. We didn't have really long rallies, so I managed it pretty good today." Three months after reaching No. 20 in the world, Kleybanova was diagnosed with Hodgkin's lymphoma. She missed almost all of the next two years, dropping out of the world rankings. Since returning to competition last month, Kleybanova is 13-1, all in tennis' minor leagues. Now ranked No. 930, which does not count her runner-up finish in a $10,000 (Futures) tournament in Buffalo, N.Y., last week, she will face Malika Rose today at 10 a.m. on Court 3. Rose, a Miramar, Fla., resident, recently completed her eligibility at Oklahoma State. Kleybanova was candid about her fitness level. "I need to play tournaments," she admitted. "I need to play matches. I need to get into tournament shape because I'm still not at my peak yet. It's going to take a while to get to that level when I can play really tough matches and perform great. Right now, I'm trying to get there step by step." Meanwhile, four players with Sacramento-area ties competed Saturday, and two advanced. In a matchup of hitting partners from the capital city, 25-year-old Yasmin Schnack dismissed 14-year-old wild card Karina Vyrlan 6-1, 6-2. "I felt conflicted," conceded Schnack, the 2010 Pacific-10 Conference Player of the Year from UCLA who retired from professional tennis last fall. "She needs the (ranking) points, and I don't." Wild card Daria Kulbikova, a Russian who will be a freshman at Sacramento State next spring, defeated Morocco Hitt of the United States 6-4, 7-5. Breanna Bachini, a wild card from the Sacramento suburb of Roseville, lost to Csilla Borsanyi of Hungary 6-2, 6-3. Bachini converted only 36.0 percent of her first serves to Borsanyi's 72.5 and committed eight double faults. She has been working with her coach, Rich Andrews, to serve harder. "The serve is easily fixable," said Bachini, who will be a junior at Syracuse in the fall. "I just have to hit a few extra baskets of balls after practice." Bachini, plagued by plantar fasciitis and bone spurs in her left foot as a freshman and sophomore, said she is finally healthy. Julia Boserup (1), United States, def. Kady Pooler, United States, 6-4, 6-1. Csilla Borsanyi, Hungary, def. Breanna Bachini, Roseville, 6-2, 6-3. Malika Rose, United States, def. Miriam Lane, United States, 6-4, 6-2. Alisa Kleybanova, Russia, def. Diana Ospina (5), United States, 6-3, 6-2. Mary Weatherholt, United States, def. Elizabeth Lumpkin (2), United States, 6-3, 6-4. Dianne Hollands, New Zealand, def. Amanda Rodgers, United States, 6-7 (4), 7-6 (4), 6-1. Daria Kulbikova, Russia, def. Morocco Hitt, United States, 6-4, 7-5. Nicole Robinson (8), United States, def. Anamika Bhargava, United States, 6-4, 6-3. Jacqueline Cako (3), United States, def. June Lee, United States, 7-6 (4), 6-3. Elizabeth Profit, United States, def. Sophia Bursulaya, United States, 7-5, 6-1. Yasmin Schnack, Sacramento, def. Karina Vyrlan, Sacramento, 6-1, 6-2. Jessica Lawrence (6), United States, def. Alexandra Champion, United States, 6-0, 6-3. Robin Anderson, United States, def. Macall Harkins (4), United States, 6-4, 6-2. Keri Wong, United States, def. Mary Closs, United States, 6-4, 6-2. Parris Todd, United States, def. Alyssa Smith, United States, 6-3, 6-1. Anne-Liz Jeukeng (7), United States, def. Zoe Scandalis, United States, 3-6, 6-4, 6-4. Yasmin Schnack, Sacramento, vs. Jessica Lawrence (6), United States. Julia Boserup (1), United States, vs. Csilla Borsanyi, Hungary. Malika Rose, United States, vs. Alisa Kleybanova, Russia. Jacqueline Cako (3), United States, vs. Elizabeth Profit, United States. Robin Anderson, United States, vs. Keri Wong, United States. Daria Kulbikova, Russia, vs. Nicole Robinson (8), United States. Parris Todd, United States, vs. Anne-Liz Jeukeng (7), United States. Mary Weatherholt, United States, vs. Dianne Hollands, New Zealand. Former top-20 player Alisa Kleybanova is scheduled to continue her comeback from cancer today in the first round of qualifying for the $50,000 FSP Gold River Women's Challenger. The 23-year-old Russian will face fifth-seeded Diana Ospina, 33, of the United States in the second match on the stadium court at the Gold River Racquet Club in the Sacramento area. The first match at 10 a.m. features Sacramento hitting partners Yasmin Schnack and Karina Vyrlan, a 14-year-old wild card. Schnack, a member of UCLA's 2008 NCAA championship team, retired from professional tennis last year at 24. Kleybanova reached No. 20 in the world in February 2011 and was diagnosed with Hodgkin's lymphoma three months later. She sat out for two years, except for one tournament in March last year. Kleybanova returned to competition last month, winning a $10,000 (Futures) tournament in Landisville, Pa., and reaching the final of another in Buffalo, N.Y., last week. The Gold River Challenger will be the third tournament of her second comeback. After the Kleybanova-Ospina match, wild card Breanna Bachini of Roseville in the Sacramento area will meet Csilla Borsanyi of Hungary on the stadium court. Bachini recently completed her sophomore season at Syracuse. As expected, Michelle Larcher de Brito of Portugal and Casey Dellacqua of Australia withdrew from the Gold River Challenger. Larcher de Brito, ranked No. 131, lost to Karin Knapp of Italy 7-5, 6-2 Friday in the third round at Wimbledon after stunning No. 3 seed and 2004 champion Maria Sharapova. Dellacqua, ranked No. 143, remains alive in Wimbledon women's doubles and mixed doubles. That leaves the Gold River Challenger with three top-200 players, pending Monday's announcement of additional wild cards: No. 114 Maria Sanchez, the defending champion originally from Modesto; No. 164 Chanel Simmonds of South Africa; and No. 175 Julie Coin of France. Admission is free for qualifying today and Sunday, $10 daily for the main draw Monday through Thursday, $20 for Friday's semifinals and $20 for next Saturday night's finals. For more information, go to www.goldriverchallenger.com. Yasmin Schnack, Sacramento, vs. Karina Vyrlan, Sacramento. Alisa Kleybanova, Russia, vs. Diana Ospina (5), United States. Csilla Borsanyi, Hungary, vs. Breanna Bachini, Roseville. Daria Kulbikova, Russia, vs. Morocco Hitt, United States. Julia Boserup (1), United States, vs. Kady Pooler, United States. Elizabeth Profit, United States, vs. Sophia Bursulaya, United States. Mary Closs, United States, vs. Keri Wong, United States. Jacqueline Cako (3), United States, vs. June Lee, United States. Macall Harkins (4), United States, vs. Robin Anderson, United States. Alexandra Champion, United States, vs. Jessica Lawrence (6), United States. Anamika Bhargava, United States, vs. Nicole Robinson (8), United States. Elizabeth Lumpkin (2), United States, vs. Mary Weatherholt, United States. Parris Todd, United States, vs. Alyssa Smith, United States. Zoe Scandalis, United States, vs. Anne-Liz Jeukeng (7), United States. Amanda Rodgers, United States, vs. Dianne Hollands, New Zealand. Malika Rose, United States, vs. Miriam Lane, United States. Michelle Larcher de Brito's stunning upset of Maria Sharapova at Wimbledon today probably is bad news for the $50,000 FSP Gold River Women's Challenger. The former Sacramento Capital in World TeamTennis tentatively would be seeded second in the tournament, Monday though July 6 at the Gold River Racquet Club in the Sacramento area. But Larcher de Brito, a 20-year-old qualifier from Portugal, will meet unseeded Karin Knapp of Italy on Friday in the third round at Wimbledon. The winner of that match will play on Monday. No matches are scheduled on the middle Sunday. Larcher de Brito in the second round at Wimbledon. Even if Larcher de Brito loses on Friday, she is unlikely to fly to Sacramento to play on hardcourts in extreme heat so soon after competing on grass in cool London, according to Gold River spokesman Clint Swett. Five top-200 players are entered in Gold River: No. 114 Maria Sanchez, the defending champion originally from Modesto; No. 131 Larcher de Brito; No. 143 Casey Dellacqua of Australia; No. 164 Chanel Simmonds of South Africa; and No. 175 Julie Coin of France. The tournament also could lose Dellacqua, who remains alive in women's doubles and mixed doubles at Wimbledon. Larcher de Brito ousted Sharapova, the third seed and 2004 champion, 6-3, 6-4 on Court 2 in the second round at Wimbledon. The 5-foot-5 (1.65-meter) Larcher de Brito outslugged the 6-foot-2 (1.88-meter) Sharapova in the one-hour, 34-minute match. Sharapova, 26, saved four match points in the last game on Larcher de Brito's serve before netting a forehand for her earliest loss at a Grand Slam tournament since falling to fellow Russian Maria Kirilenko in the first round of the 2010 Australian Open. "It's frustrating," Sharapova, a former world No. 1 who has won all four Grand Slam tournaments once, told reporters after the first match of her career against Larcher de Brito. "You don't want to lose matches, whether it's early or late in the draw, but this tournament is extremely special, so it's especially tough to lose here. "But I'm going to keep my head high about it because there's no other way. I'll find the positives out of what I have done today and in my career, set new goals and try to just keep moving forward." Larcher de Brito had beaten three top-20 players in her career but never a top-10 opponent. "I'm really excited," said Larcher de Brito, who speaks fluent English because she has a South African mother and trained under Nick Bollettieri in Florida. "I really can't believe it. It's a little bit of shock and excitement. I'm just really happy I got through that match. It was a really great win for me. "The end was really nerve-wracking. I tried to stay calm. I gave it my all. It was 5-4. If I lost that, it would have been 5-all. If it were 5-all, it would have been tough to get back up again, because she was serving, and she was serving extremely well. I thought, 'Now or never.' ... "
Larcher de Brito already has had a long, rocky career. She turned pro in February 2007, nine days after her 14th birthday. Larcher de Brito became the seventh-youngest player to win a WTA main-draw match the following month and the youngest player in WTT history that summer, helping Sacramento win the last of its record six league titles. American Madison Keys surpassed Larcher de Brito for the WTT record by 19 days two years later as a 14-year-old with the Philadelphia Freedoms. The 5-foot-10 (1.78-meter) Keys is now ranked a career-high 53rd at 18 years old. Wayne Bryan, who will return for the 12th year as the Capitals' coach next month, said in 2007 that Larcher de Brito had top-10 potential. "She has magic hands," Bryan, the father and first coach of doubles stars Bob and Mike Bryan, told The Sacramento Bee. "She has a huge forehand and backhand, and she plays close to the baseline. She takes your breath away when she hits groundstrokes. She hits the ball really hard." Larcher de Brito seemed to be on her way in 2009, advancing to the third round of the French Open and climbing to a career-high No. 76 at 16 years old. But she struggled from then until this week. Playing largely in tennis' minor leagues, Larcher de Brito had not won a main-draw match on the WTA tour since last July. "When I was 16, when I was in the top 100, everybody was comparing me to like Martina Hingis and expecting me to win a Grand Slam at that age," Larcher de Brito said. "But that doesn't happen anymore, winning Grand Slams so young. Tennis is such a competitive sport now and so hard, it's just really hard to stay there. "But I just tried to keep going, and now I'm here again, and I hope to keep doing well all year." Larcher de Brito's parents, Antonio and Caroline, gave her moral support through the hard times. Antonio is Portuguese. "I wouldn't be here if it wasn't for my parents," said Larcher de Brito, whose great grandfather was French (hence the name Larcher, which she pronounces LAR-sher and is pronounced Lar-SHAY in French). "I'm not one of those players who is going to make up excuses like I was sick or injured, none of that. I simply wasn't playing well. I had no motivation. "I'm just lucky I had my parents next to me, supporting me, helping me to keep going. It was really tough for me at one stage. The only people I had left were my mom, my dad, my brothers. They were supporting me through this really tough time. Now they're still here with me when I'm succeeding. "I'm not going to lie. I did drop off the radar a little bit. That's just why it makes the wins that much sweeter. I'm really grateful to have a wonderful family that supported me all these years." Knapp, Larcher de Brito's next opponent, advanced with a 4-6, 6-4, 6-4 victory over 27th-seeded Lucie Safarova of the Czech Republic. Until this week, the 25-year-old Knapp had never won a main-draw match at Wimbledon. She is ranked No. 104 after reaching a career-high No. 35 in 2008.. The 5-foot-11 (1.80-meter) Knapp is 1-0 lifetime against Larcher de Brito, prevailing 4-6, 6-2, 7-6 (1) in the final round of qualifying for the 2011 U.S. Open. The winner of the match between Larcher de Brito and Knapp could face 15th-seeded Marion Bartoli, the Wimbledon runner-up in 2007, in the fourth round. In the first round of women's doubles, Megan Moulton-Levy of Washington, D.C., and Shuai Zhang of China defeated Mona Barthel of Germany and Liga Dekmeijere of Latvia 6-4, 5-7, 6-2. The 5-foot- (1.52-meter) Moulton-Levy, 28, is scheduled to make her WTT debut for the Capitals on July 7. She and Zhang will meet 12th-seeded Ashleigh Barty, a 17-year-old Australian, and Dellacqua in the second round. Barty and Dellacqua, a 28-year-old left-hander, in January became the first Aussie women to reach the Australian Open final since 1977. They lost to top-seeded Italians Sara Errani and Roberta Vinci. In the opening round of men's doubles, 14th-seeded Rohan Bopanna of India and Edouard Roger-Vasselin of France topped Jarkko Nieminen of Finland and Dmitry Tursunov of Russia 7-6 (5), 6-2, 7-6 (6). Nieminen and Tursunov, who's based in the Sacramento suburb of Granite Bay, won the Munich title on clay last month in only their second tournament together. Within about two hours, all three Northern California singles players at Wimbledon lost today in the first round. No. 21 seed Sam Querrey, a San Francisco native and part-time member of the Sacramento Capitals in World TeamTennis, fell to Bernard Tomic of Australia 7-6 (6), 7-6 (3), 3-6, 2-6, 6-3. Dmitry Tursunov, a Moscow native based in the Sacramento suburb of Granite Bay, succumbed to No. 13 seed Tommy Haas of Germany 6-3, 7-5, 7-5. And Mallory Burdette, a former Stanford All-American, was ousted by Urszula Radwanska of Poland 7-6 (3), 4-6, 6-2. At least Scott Lipsky, another ex-Stanford star, won in the opening round of doubles. Several other Northern California players also remain alive or have yet to play in doubles. None of the singles losses was surprising, even though Querrey is ranked No. 19 in the world (first among Americans) to Tomic's No. 59, Haas is 35 years old, and Urszula is the "other" Radwanska. Tomic, 6-foot-5 (1.96 meters), reached the Wimbledon quarterfinals as a qualifier two years ago at 18 and had beaten Querrey in their only previous meeting. Tomic was treated for dizziness in the fourth set today because, he later told reporters, he hadn't eaten enough breakfast. Meanwhile, the 6-foot-6 (1.98-meter) Querrey has never advanced past the fourth round in 26 Grand Slam tournaments. Tursunov, ranked No. 65 after reaching a career-high No. 20 in 2006, fell to 1-5 lifetime against Haas. It was Tursunov's first match since he aggravated a strained hamstring muscle three weeks ago in the French Open. Haas climbed to No. 2 in 2002 and reached the Wimbledon semifinals in 2009 before losing to eventual champion Roger Federer. Earlier this month, Haas became the oldest quarterfinalist in the French Open since 1971. Haas and Tursunov have several similarities. Both are in their 30s (Tursunov turned 30 last December). Both moved to the United States at a young age -- Tursunov at 12 and Haas at 14 -- to train. And both have been plagued by injuries throughout their careers. Burdette, ranked 69th, made her Wimbledon debut after turning pro last September and forgoing her senior year at Stanford. She and Radwanska, ranked 38th, met for the first time. Radwanska beat former No. 1 players Ana Ivanovic and Venus Williams in back-to-back clay-court tournaments, the Italian Open and French Open, in May. Radwanska also reached the fourth round at Indian Wells in March, upsetting 15th-seeded Sloane Stephens in the second round. Burdette lost to Radwanska's older sister, fourth-ranked Agnieszka, in the second round of the French Open last month.Agnieszka reached last year's Wimbledon final, losing to Serena Williams. The 10th-seeded team of Lipsky, from Irvine in the Los Angeles area, and Santiago Gonzalez of Mexico defeated Paolo Lorenzi of Italy and Benoit Paire of France 6-4, 7-6 (3), 6-4. Gonzales and Lipsky will face either Lukas Dlouhy of the Czech Republic and Rajeev Ram of Carmel, Ind., or Canadian qualifiers Jesse Levine and Vasek Pospisil. 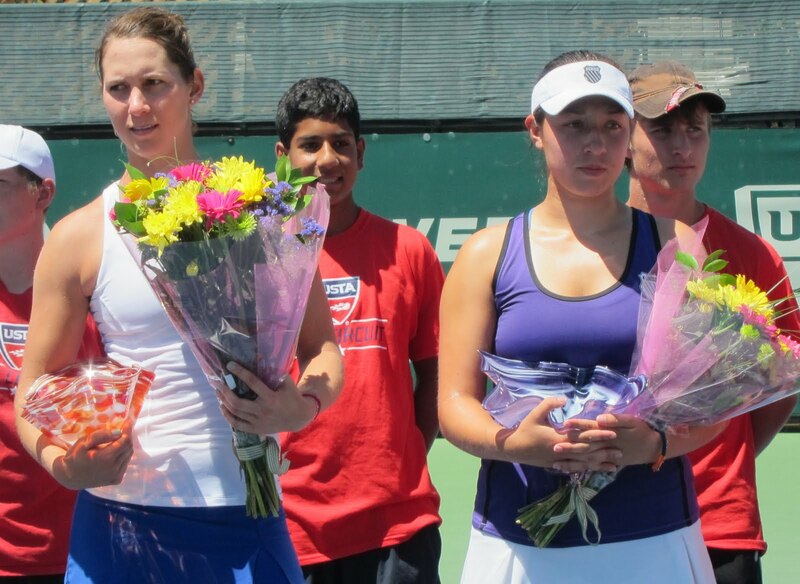 Michelle Larcher de Brito is scheduled to go from Wimbledon to the Sacramento area. Michelle Larcher de Brito in the second round at Wimbledon. 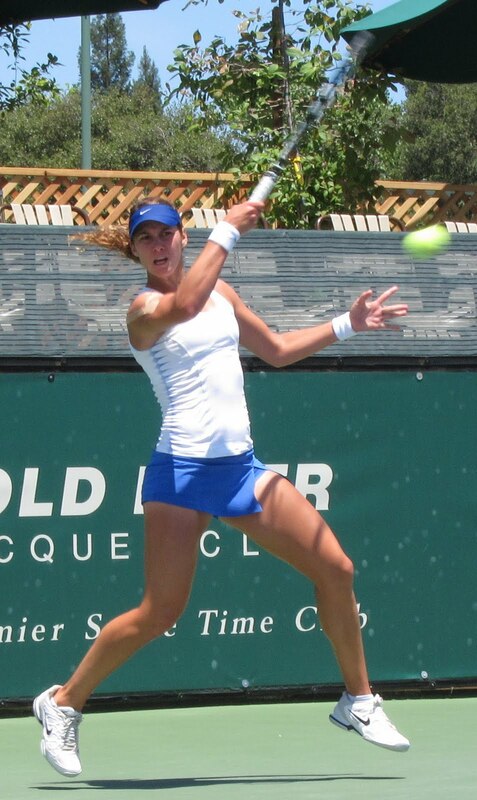 ﻿ Larcher de Brito, who helped the Sacramento Capitals win the last of their record six World TeamTennis titles in 2007 at 14 years old, tentatively will be seeded second in next week's $50,000 FSP Gold River Women's Challenger at the Gold River Racquet Club. She outlasted 21-year-old Melanie Oudin of Marietta, Ga., 7-6 (7), 1-6, 6-4 in a battle of undersized players who have struggled after early success. Larcher de Brito, 5-foot-5 (1.65 meters), is ranked No. 131 after reaching a career-high No. 76 at 16 in 2009. Oudin, 5-foot-6 (1.68 meters), is No. 123 after climbing as high as No. 31 at 18 in 2010. Sharapova, ranked third, defeated Kristina Mladenovic of France 7-6 (5), 6-3 on Centre Court. Larcher de Brito played only one season for the Capitals. At 14, she was the youngest competitor in league history until American Madison Keys surpassed her by 19 days two years later as a 14-year-old with the Philadelphia Freedoms. The 5-foot-10 (1.78-meter) Keys, 18, is now ranked a career-high 53rd. In the first round of women's doubles today at Wimbledon, fifth-seeded Raquel Kops-Jones of Fresno and Abigail Spears of San Diego beat Shahar Peer of Israel and Yan Zi of China 6-4, 6-4. Kops-Jones won the NCAA doubles title with Cal teammate Christina Fusano, a Sacramento native, 10 years ago. Kops-Jones and Spears, Wimbledon quarterfinalists last year, will play the winner of the match between Sandra Klemenschits of Austria and Romina Oprandi of Switzerland in the second round. Yan and Zheng Jie won China's first Grand Slam title of any kind in women's doubles at the 2006 Australian Open and also captured the Wimbledon crown that year. Peer advanced to the doubles final of the 2008 Australian Open with Victoria Azarenka and won the doubles title at Stanford with Anna-Lena Groenefeld in 2006 and Sania Mirza in 2007. Men's and women's first round, ESPN, 4 a.m.-2 p.m. (live). Wimbledon Primetime, Tennis Channel, 2-9 p.m. (daily recap), 9 p.m.-4 a.m. Tuesday (repeat). Wimbledon Primetime, Tennis Channel, 2-9 p.m. (daily recap), 9 p.m.-4 a.m. Wednesday (repeat). Men's and women's second round, ESPN2, 4 a.m.-2 p.m. (live). Wimbledon Primetime, Tennis Channel, 2-9 p.m. (daily recap), 9 p.m.-4 a.m. Thursday (repeat). Men's and women's second round, ESPN, 4 a.m.-2 p.m. (live). Wimbledon Primetime, Tennis Channel, 2-9 p.m. (daily recap), 9 p.m.-4 a.m. Friday (repeat). Men's and women's third round, ESPN, 4 a.m.-2 p.m. (live). Wimbledon Primetime, Tennis Channel, 2-9 p.m. (daily recap), 9 p.m.-4 a.m. Saturday (repeat). Men's and women's third round, ESPN, 4 a.m.-1 p.m. (live). Wimbledon Primetime, Tennis Channel, 2-9 p.m. (daily recap), 9 p.m.-4 a.m. Sunday (repeat). Week 1 highlights, ABC. No matches scheduled on middle Sunday. Wimbledon Primetime, Tennis Channel, 4-8 p.m. (daily recap), 8 p.m.-midnight (repeat), midnight-4 a.m. Monday (repeat). Men's and women's fourth round (all courts except Centre Court), ESPN2, 4 a.m.-2 p.m. (live). Men's and women's fourth round (Centre Court), ESPN, 5 a.m.-noon (live). Women's quarterfinals (all courts except Centre Court), ESPN2, 4 a.m.-1 p.m. (live). Women's quarterfinals (Centre Court), ESPN, 5-10 a.m. (live). Men's quarterfinals (all courts except Centre Court), ESPN2, 4 a.m.-1 p.m. (live). Men's quarterfinals (Centre Court), ESPN, 5 a.m.-noon (live). Women's semifinals, ESPN, 4-10 a.m. (live). Men's semifinals, ESPN, 4-11 a.m. (live). Women's final and doubles finals, ESPN, 5 a.m.-noon (live). Women's final, ABC, noon-3 p.m. (repeat). Wimbledon Primetime, Tennis Channel, 4-8 p.m. (daily recap), 8 p.m.-midnight (repeat), midnight-4 a.m. Sunday (repeat). Men's final, ESPN, 5 a.m.-noon (live); noon-3 p.m., ABC (repeat). Mardy Fish, 31 years old, Sacramento Capitals of World TeamTennis (2012-13) -- No. 43 in singles (no change), No. 347 in doubles (no change). Bradley Klahn, 22 years old, 2010 NCAA singles champion and 2011 NCAA doubles runner-up from Stanford -- Career-high No. 178 in singles (no change), No. 281 in doubles (no change). Scott Lipsky, 31 years old, 2002 NCAA doubles runner-up from Stanford -- Career-high No. 21 in doubles (no change), unranked in singles. Sam Querrey, 25 years old, San Francisco native, Capitals (2012-13) -- No. 19 in singles (no change), No. 95 in doubles (no change). Ryan Sweeting, 25 years old, Capitals (2012-13) -- No. 293 in singles (-6), No. 864 in doubles (+1). Dmitry Tursunov, 30 years old, Folsom resident from Russia -- No. 65 in singles (no change), No. 205 in doubles (-63). Mallory Burdette, 22 years old, NCAA singles runner-up in 2012 and NCAA doubles champion in 2011 and 2012 from Stanford -- Career-high No. 69 in singles (no change), No. 346 in doubles (no change). Raquel Kops-Jones, 30 years old, 2003 NCAA doubles champion from Cal -- Career-high No. 12 in doubles (no change), unranked in singles. Megan Moulton-Levy, 28 years old, Capitals (2013) -- Career-high No. 59 in doubles (no change), unranked in singles. Maria Sanchez, 23 years old, Modesto product -- No. 114 in singles (no change), No. 113 in doubles (no change). Taylor Townsend, 17 years old, Capitals (2013) -- Career-high No. 333 in singles (no change), No. 537 in doubles (no change). Monday-July 7 -- WIMBLEDON, www.wimbledon.com. 2012 champions: Roger Federer, Serena Williams, Jonathan Marray-Frederik Nielsen, Serena Williams-Venus Williams. Saturday-July 6 -- $50,000 Gold River Women's Challenger, Gold River Racquet Club, Gold River, Calif. Saturday-June 30, qualifying; July 1 (main draw), 10 a.m.; July 2-4, noon and 6:30 p.m.; July 5 (Friday semifinals), 4 p.m.; July 6 (Saturday finals), 7 p.m. www.goldriverchallenger.com. 2012 champions: Maria Sanchez, Asia Muhammad-Yasmin Schnack. July 7 -- Sacramento Capitals open season vs. Texas in World TeamTennis, Capitals Stadium at Sunrise Mall in Citrus Heights, Calif., 7:35 p.m., www.saccaps.com. July 8 -- Capitals vs. Philadelphia, Capitals Stadium at Sunrise Mall in Citrus Heights, Calif., 7:35 p.m., www.saccaps.com. July 10 -- Capitals (with Mardy Fish) vs. Orange County, Capitals Stadium at Sunrise Mall in Citrus Heights, Calif., 7:35 p.m., www.saccaps.com. July 12 -- Capitals (with Mardy Fish) vs. Boston, Capitals Stadium at Sunrise Mall in Citrus Heights, Calif., 7:35 p.m., www.saccaps.com. July 13 -- Capitals (with Mardy Fish) vs. Washington, Capitals Stadium at Sunrise Mall in Citrus Heights, Calif., 7:35 p.m., www.saccaps.com. July 17 -- Capitals vs. Texas (with Bob and Mike Bryan), Capitals Stadium at Sunrise Mall in Citrus Heights, Calif., 7:35 p.m., www.saccaps.com. July 22 -- Capitals (with Sam Querrey) vs. Orange County, Capitals Stadium at Sunrise Mall in Citrus Heights, Calif., 7:35 p.m., www.saccaps.com. of last year's inaugural FSP Gold River Women's Challenger. One day after last year's champion accepted a wild card in the $50,000 FSP Gold River Women's Challenger, 2012 runner-up Jessica Pegula withdrew. Jessica Pegula, a 19-year-old resident of Boca Raton, Fla., today dropped off the acceptance list for the July 1-6 tournament. But Maria Sanchez, a 23-year-old Modesto native, plans to defend her title at the Gold River Racquet Club in the Sacramento area. Sanchez, a former USC All-American who's mentored by International Tennis Hall of Famer Chris Evert, defeated Pegula 4-6, 6-3, 6-1 in the final of last year's inaugural tournament. Pegula's billionaire father, Terry, owns the Buffalo Sabres of the National Hockey League. Five players ranked in the top 200 in the world tentatively are entered in the Gold River Challenger. Sanchez tops the list at No. 114. She is followed by Michelle Larcher de Brito of Portugal at No. 131, Casey Dellacqua of Australia at No. 145, Chanel Simmonds of South Africa at No. 165 and Julie Coin of France at No. 176. Larcher de Brito played one season for the Sacramento Capitals, helping them win the last of their record six World TeamTennis titles in 2007. At 14, she was the youngest player in league history until Madison Keys surpassed her by 19 days two years later as a 14-year-old with the Philadelphia Freedoms. Keys, who also lives in Boca Raton, is now ranked a career-high 53rd. Dellacqua, a 28-year-old left-hander, won the 2011 French Open mixed doubles title with former Stanford All-American Scott Lipsky and reached this year's Australian Open women's doubles final with Ashleigh Barty, then 16. It was the first time since 1977 that two Aussie women played in the Australian Open title match. See below for the full updated Gold River Challenger acceptance list. U.S. Open National Playoffs -- Andrew Ball, Giuliana Olmos and the mixed doubles team of Eric Roberson and Yasmin Schnack won titles in Salinas in Northern California Sectional Qualifying for the U.S. Open National Playoffs. All advanced to the U.S. Open National Playoffs Championship in New Haven, Conn. Winners of the men's and women's singles events, Aug. 16-19, will receive wild cards in the U.S. Open qualifying tournament scheduled for Aug. 20-23. The champions of the mixed doubles event, Aug. 21-24, will earn a berth in the mixed doubles main draw of the U.S. Open, Aug. 26-Sept. 9. Ball, a Palo Alto resident who will be a freshman at Harvard in the fall, defeated Joshua Pompan of Salinas 6-3, 6-1 in the sectional final. Fremont's Olmos, who recently finished her sophomore year at USC, held off Lejla Hodzic of Santa Clara 6-1, 6-4 for the title. Roberson and Schnack, both from the Sacramento area, routed Conor Berg and Hadley Berg of Greenbrae 6-2, 6-1 in the final. Schnack played on UCLA's NCAA championship team in 2008 as a sophomore and retired from professional tennis last year. Roberson played at Boise State. ﻿﻿﻿﻿ Maria Sanchez will defend her title in the $50,000 FSP Gold River Women's Challenger. The 23-year-old Modesto native accepted a wild card for the July 1-6 tournament at the Gold River Racquet Club in the Sacramento area, spokesman Clint Swett announced today. Sanchez was eliminated from Wimbledon singles and doubles qualifying on Thursday, clearing the way for the former USC All-American to return to Gold River. With a world ranking of No. 114, she could be seeded first. Sanchez defeated Jessica Pegula, 18 at the time, 4-6, 6-3, 6-1 in the final of the inaugural Gold River Challenger last year. Pegula also is scheduled to return. Sam Querrey, seeded 21st, will face Bernard Tomic of Australia next week in a battle of tall, powerful players. Querrey is 6-foot-6 (1.98 meters) and Tomic 6-foot-5 (1.96 meters). Dmitry Tursunov, a 30-year-old Russian based in the Sacramento area, will meet 13th-seeded Tommy Haas, 35, of Germany in a matchup of two injury-prone players. Tomic in the first round. ﻿﻿﻿ And in women's singles, former Stanford star Mallory Burdette will take on dangerous Urszula Radwanska of Poland. Wimbledon begins Monday and concludes on July 7. Tomic reached the Wimbledon quarterfinals as a qualifier two years ago at 18. Querrey advanced to the fourth round at Wimbledon three years ago, matching his best Grand Slam result to date. In the players' only career meeting, Tomic defeated Querrey 3-6, 6-3, 7-6 (3), 6-3 in the second round of last year's Australian Open. Tomic, however, has fallen from a career-high No. 27 in the world one year ago to No. 64. Querrey is ranked 19th, two spots below his career high in January 2011. He and Tomic are in the same quarter of the draw as ninth-seeded Richard Gasquet; seventh-seeded Tomas Berdych, the 2010 runner-up; and top-ranked Novak Djokovic, the 2011 champion. Tursunov, who trains at the Gorin Tennis Academy in Granite Bay, is scheduled to play for the first time since aggravating a pulled left hamstring muscle three weeks ago in the second round of the French Open. The 65th-ranked Tursunov is 1-4 lifetime against Haas, who's ranked 13th after ascending to a career-high No. 2 in 2002. Their last encounter came at Wimbledon in 2007, with Haas prevailing 1-6, 6-4, 7-6 (5), 6-4 in the third round. Tursunov advanced to the fourth round at Wimbledon in 2005 and 2006 for his best Grand Slam singles results to date. Haas reached the Wimbledon semifinals in 2009 before losing to eventual champion Roger Federer. Earlier this month, Haas became the oldest quarterfinalist in the French Open since 1971. Burdette, ranked 69th, will make her Wimbledon debut after forgoing her senior year at Stanford and turning pro last September. She and Radwanska, ranked 38th, have never met. Burdette lost to Radwanska's older sister, fourth-ranked Agnieszka, in the second round of the French Open last month. Agnieszka reached last year's Wimbledon final, losing to Serena Williams. Defending champion Maria Sanchez could receive a wild card for the $50,000 FSP Gold River Women's Challenger. The way was cleared for the 23-year-old Modesto native to return when she was eliminated from Wimbledon singles and doubles qualifying today. With a singles world ranking of No. 114, she could be seeded first in the July 1-6 tournament at the Gold River Racquet Club in the Sacramento area. An announcement might come Thursday, according to tournament spokesman Clint Swett. Sanchez's return tentatively would give the Gold River Challenger both finalists from last year's inaugural tournament. Sanchez defeated Jessica Pegula, then 18, of Boca Raton, Fla., 4-6, 6-3, 6-1. Meanwhile, Russia's Alisa Kleybanova, a former top-20 player who has won two WTA titles, probably will play in the June 28-29 qualifying event for the Gold River Challenger, Swett announced. The 23-year-old Kleybanova has been fighting Hodgkin's lymphoma, a form of cancer, for the past two years. Sanchez, playing Wimbledon qualifying for the first time this year, lost to Israeli veteran Shahar Peer 6-3, 6-2 in the second round in London. Sanchez, a former All-American at USC who's mentored by International Tennis Hall of Famer Chris Evert, also fell in the first round of doubles qualifying. She and Olga Puchkova of Russia succumbed to fifth-seeded Raluca Olaru of Romania and Olga Savchuk of Ukraine 3-6, 6-2, 6-3. Puchkova played two matches for the Sacramento Capitals of World TeamTennis in 2008 and reached the singles final of the $25,000 Oak River Rehab Challenger in Redding in 2011. Peer climbed to a career-high No. 11 in the world in 2011 but, hampered by injuries, has plunged to No. 168. She reached the quarterfinals of the Australian Open and U.S. Open in 2007 and the fourth round at Wimbledon in 2008. In doubles, Peer advanced to the final of the 2008 Australian Open with Victoria Azarenka and won the title at Stanford with Anna-Lena Groenefeld in 2006 and Sania Mirza in 2007.